I love doing my makeup. I always have, and likely always will. Whether I am late, tired, or simply not in the mood for it, I can still do a decent job with my makeup. When it comes to hair, it is a whole different story. I just don’t have the patience (nor the skills, to be honest) that I would need to make my hair look nicely done. Most days that results in a low ponytail or a bun of some sort. Whatever way I can do to get my hair done quickly and easily, is likely what I will try. My latest discovery to make my hair styling really quick and easy is the Dafni Ceramic Brush* (available here), a hair straightener in the form of a brush, which straightens my hair—without flattening it out—in a matter of minutes (now we’re talking!). Here’s how it works. I start with dry hair, which I first brush to remove any knots. Then I turn on the Dafni brush, which takes about one minute to fully heat up. Once I hear the sound telling me that it is ready, I proceed with brushing. 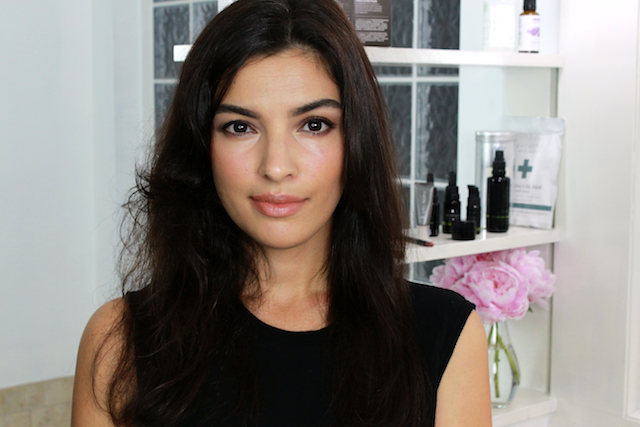 Depending on how much time I have, I begin to straighten larger or smaller sections of hair. When I have very little time, I work with larger sections of hair, focusing mainly on my bangs (if you have bangs, you’ll probably love this tool) and wherever my hair looks frizzy. 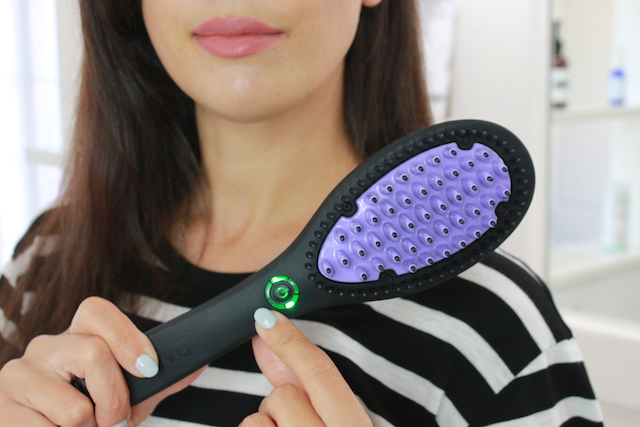 When I have a few extra minutes, I create smaller sections of hair and brush through slowly with the Dafni. Brushing smaller sections obviously gives me a more polished result, but the brush & go technique still gives me a quite good result. How does this compare to a regular straightener, you may ask? First of all, I find that there is a significant time difference. As I said, I can get a pretty good result using bigger sections of hair, which I cannot do with my regular hair straightener. 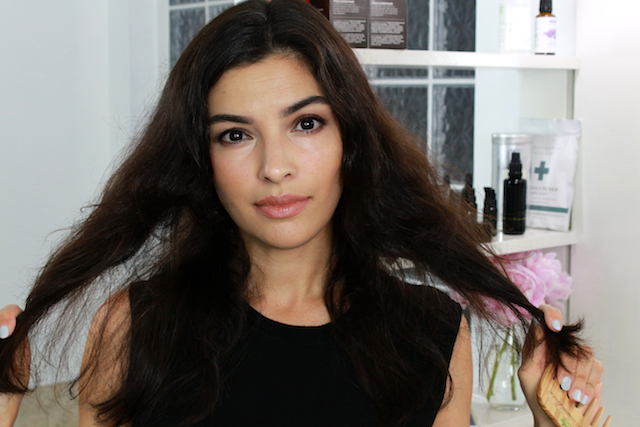 Second, the Dafni brush does not flatten my hair. It does not give that “ironed” look to the hair, but more of a blowout look. You may notice this from my before/after pic below. In particular, I like to use in the front portion of my hair (my bangs), because it straightens it without making it look flat. Lastly, I see a significantly smaller chance of myself getting burned with the Dafni brush than a regular flat iron. Admittedly, I am a bit clumsy, and I have burned myself several times using regular flat irons. 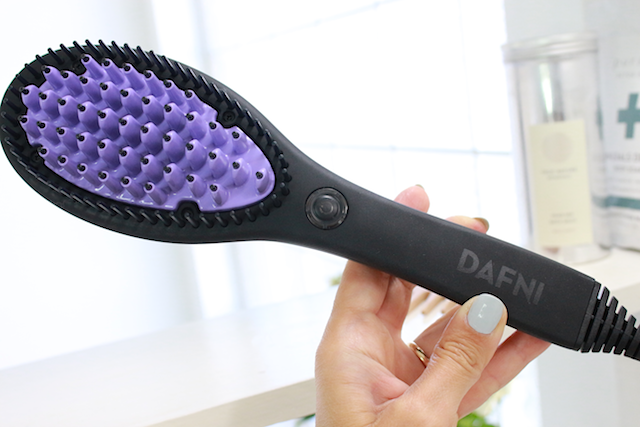 The Dafni brush has these black plastic tips that don’t allow the heated ceramic part (the purple part) to touch the scalp or burn my fingers. The company still recommends handling it carefully, but I think that the chance of burning myself is less with this design. Hair must be brushed well with a comb/brush before using the Dafni Brush. 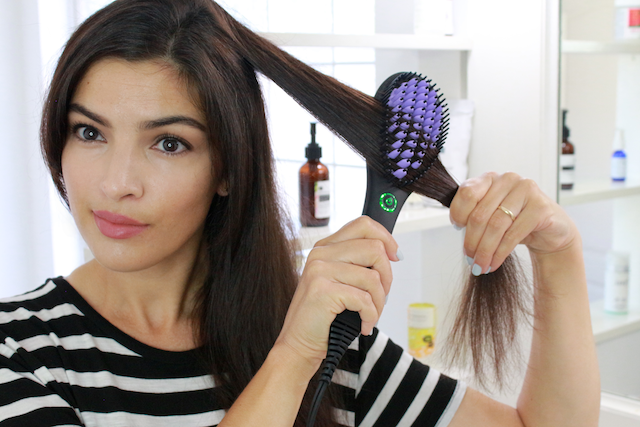 Don’t think of it as a brush; think of it as a hair straightener with bristles. If the brush gets stuck in a knot, it is annoying. I have to put down the Dafni brush, comb the hair, and then go back to Dafni. Hair must be completely dry before using Dafni. You may want to hold your hair while your brushing your hair with Dafni, like in the photo above, and make sure that the hair as actually in contact with the deepest part of the brush (the purple ceramic part) so the heat can reach your hair evenly. Brush from underneath (like in the photo above), rather than on top of your hair. I find that it helps to get more volume and gives a more neat result. If you prefer the look of perfectly flat, spaghetti-straight hair, Dafni may not be the tool for you. I find that even when I use it slowly, it still leaves a bit of volume in my hair. The retail price at the only authorized retailer in the US is $48.99 (which you can find here). It’s so easy to use that I really don’t have anything else to add. Also, I don’t have curly hair, but I have used it on someone who has curly hair, and it worked very well. I went ahead and took some photos of a before, half-head done, and after. Bear in mind that I did it quickly, using larger sections of hair. This is definitely my favorite thing about this tool, a blowout-like result in a few minutes. If your hair styling skills are as pathetic as mine, you might find this a good investment. 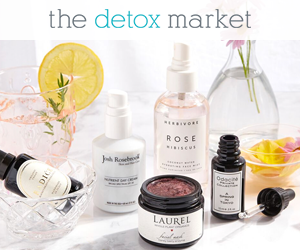 You can purchase it here. If you have any questions, please leave a comment below.